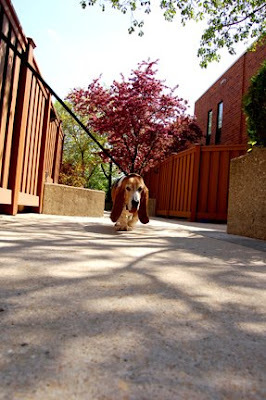 FUN FACTS ABOUT BASSET HOUNDS! *The Basset Hound is a short-legged breed of dog of the hound family. They are scent hounds, bred to hunt by scent. Their sense of smell for tracking is second only to that of the Bloodhound. The name Basset derives from the French word "bas" meaning "low"; "basset" (-et attenuating suffix) meaning, literally, "rather low". *Basset Hounds are a breed of French lineage, believed by some to be a descendant of the St. Hubert's Hound, a dog similar to the present-day Bloodhound. Friars of St. Hubert's Abbey in medieval France reputedly desired a shorter-legged dog, capable of following a scent under brush in thick forests, as hunting was a classic sport of the time. Both Bassets and St. Hubert's Hounds were bred to trail, not kill, their game. *The breed is known for its hanging skin structure, which causes the face to occasionally look sad; this, for many people, adds to the breed's charm. 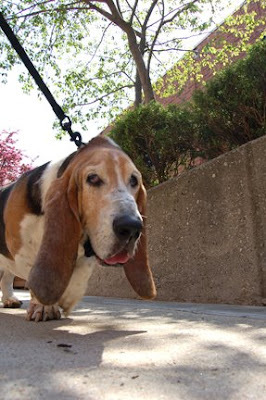 *The Basset Hound is a large dog on short legs. They were originally bred by the French to have achondroplasia, known as dwarfism. Their short stature can be deceiving; Bassets are surprisingly long and can reach things on table tops that dogs of similar heights cannot. *The Basset Hound is often considered a friendly breed. Bassets are friendly and welcome the opportunity to make new friends. For this reason they are an excellent pet for families with children and other pets. *Bassets might howl or bark when they want something or to suggest that they think something is wrong (like a storm is coming). They also use a low, murmuring whine to get attention, which sounds to many owners as though their Bassets are "talking". *Cartoon character Droopy Dog was a Basset, created by Tex Avery in 1943. *Elvis Presley famously sang "Hound Dog" to a Basset Hound named Sherlock on The Steve Allen Show on July 1, 1956. *One of the most famous television Bassets was Flash, the dog owned by Sheriff Roscoe P. Coltrane in the 1980's series The Dukes Of Hazzard. *The logo for Hush Puppies brand shoes prominently features a Basset Hound.